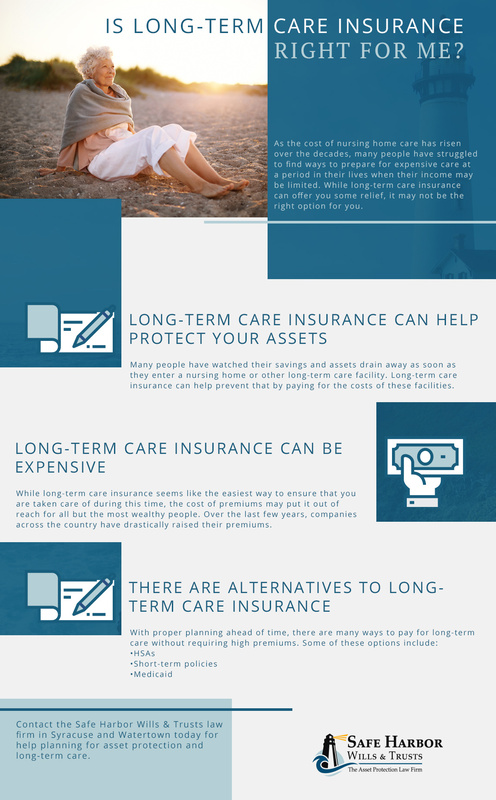 Asset Protection Syracuse: Do I Need Long-Term Care Insurance? As the cost of nursing home care has risen over the decades, many people have struggled to find ways to prepare for expensive care at a period in their lives where their income may be limited. While long-term care insurance does offer you some relief, it may not be the right option for you. Read on to learn more about long-term care insurance, as well as some information about how our law firm can help you find other ways to take care of yourself as you age. Many people have watched their savings and assets drain away as soon as they enter a nursing home or other long-term care facility. Long-term care insurance can help prevent that by paying the costs of these facilities. While long-term care insurance seems like the easiest way to ensure that you are taken care of during this time, the cost of premiums may put it out of reach for all but the most wealthy people. Over the last few years, companies across the country have drastically raised their premiums. Health savings accounts (HSAs). HSAs are an excellent way to begin saving for long-term care while you still have a regular income. If you have a high-deductible plan, an HSA can help pay for care that the plan does not cover. Short-term policies. Short-term policies will pay for care for a limited period of time (usually around one year), which may be enough time for you to recover or find other ways to pay for your ongoing care. Medicaid. Medicaid can help people pay for long-term care as long as you meet certain income requirements. Our lawyer can help you find out if you qualify. One of the easiest ways to prepare for nursing home costs is to speak with a lawyer who has experience with elder law and asset protection. At Safe Harbor Wills & Trusts, our attorney works exclusively in this field. He will work with you to develop a plan that balances paying for your care with estate planning and asset protection. Contact the Safe Harbor Wills & Trusts law firm in Syracuse and Watertown today for help planning for asset protection and long-term care. With help from us, you may be able to afford the care you require while still being able to leave an estate that you want.